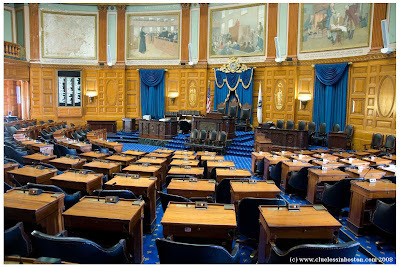 Chamber of the Massachusetts State House. It is in this room that the larger of the two legislative bodies conducts its business. The Speaker of the House is elected by the representatives and presides from the elevated chair behind the podium. Representatives can vote electronically by pushing a green "yea" or a red "nay" button on their desks. The results of the vote appear next to each representative's name on the boards in the front of the room. The room is paneled in Honduras mahogany. Behind the Speaker's podium are the Albert Herter murals, "Milestones on the Road to Freedom." The names on the ceiling cornice commemorate men who made important contributions to the commonwealth and the nation prior to 1895. Nice shot. Our state legislature has had a lot of controversy over the past few years. one of these days, I'm going to go down and take photos there. Those desks do remind me of grade school. Lol@chuck but true, love the blue colors...may I know your name so I can address you correctly when I comment? Thanks! Beautiful chamber, you took a great photo. Great shot! And info, too. Funny how nobody counts after 1895, lol. Regarding your comment at my blog Atlântico Azul, for which I thank you, please note that the building in the photo is Lisbon's Town Hall. In what concerns the GPS system, I have to find the Memorandum of Understanding between the entities (Town Hall, Government, Vodafone Foundation and the representatives of the taxi owners), signed September 2007. The Lisbon Mayor stated that the Town Hall pays 27% of the costs of this Program, which include the equipments and the training expenses with the taxi drivers. It is probable, but I am not sure, that the Government and Vodafone Foundation will also pay other costs. Glad you liked it. I loved the idea of travelling in a taxi where the driver knows exactly how to go to where I am going, apart from the safety aspect! Why do most halls look the same? I wish they'd paint this a bit brighter. Thanks for visiting Norwich Daily Photo and for leaving your comments.